Want to Learn the Benefits of Rabbit mAbs? MonoRab™ is a full scale service including antigen preparation, rabbit immunization, recombinant antibody production, and antibody sequencing; ensuring ultimate levels of reproducibility and mAb purification. Talk to our technical specialists today to learn why GenScript's MonoRab™ service is perfect for everything from basic research,to in vitro diagnostics (IVD), anti-idiotype (Anti-ID) mAb generation, and more. Get a quote to let GenScript help make your research easy today! 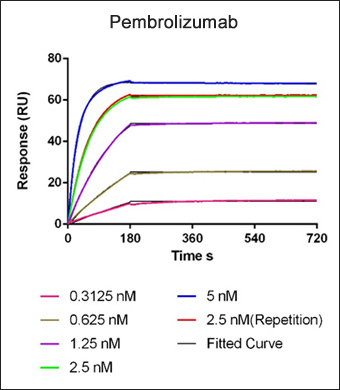 A The cross reactivity rate of GenScript produced anti-Ractopamine (small molecule) rabbit mAb is 0.0304%, showing low cross reactivity rates with similar compounds. 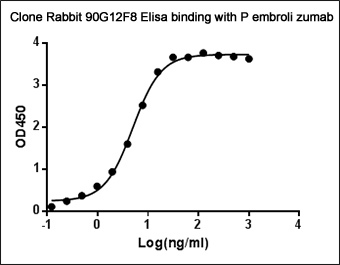 B GenScript produced anti-idiotype rabbit mAb 90G12F8 binds with Pembrolizumab (mAb drug) with an EC50 of 5.001 ng/ml as shown via ELISA. 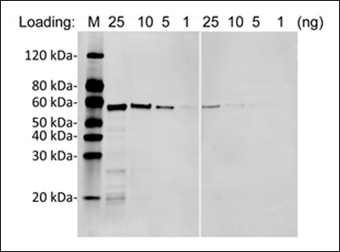 C Genscript produced N-Terminal anti-flag-tag rabbit (section 1) mAb shows higher specificity and affinity than those produced in mouse (section 2) as shown via western blot. 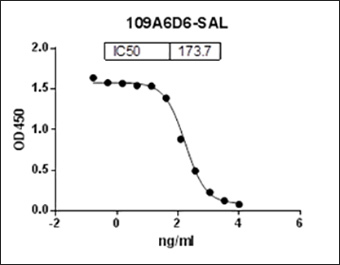 D GenScript produced anti-idiotype rabbit mAb 90G12F8 has a KD valu e of 2.3x10-12 M against the antibody drug (Pembrolizumab) as shown via ELISA. GenScript's Premier Rabbit Monoclonal Antibody Generation Platform, Featured in this Week's "Supplier Insider" Video from "The Scientist".